Summit Theater and Tectonic Theater Project. This collaboration brought to vivid life a fairy tale dating back to the 16th c. The hero is a member of the class known in nearly every culture as "helper animals", those who help humans to survive and thrive. Puss in Boots is a rascal--he lies and cheats to get what he wants; but he is clever and resourceful and secures a princess bride and a castle for his poor master who, as third son of a miller, received no other inheritance. The inventive Bunraku-style puppets were created by London's Blind Summit Theater (designed by Nick Barnes) and interacted with live performers and characters who were half human and half puppet as seen in the photo above. They were supremely effective in telling the story (puppet direction by Mark Down and stage direction by Moisés Kaufman). Sets were designed by Andromache Chalfant and lit by David Lander. Costume design was by Clint Ramos. Every element was as close to perfection as one could get. Musical values were beyond wonderful. Under the baton of Neal Goren the Gotham Chamber Opera Orchestra, comprising but a dozen musicians, realized Xavier Montsalvatge's music in the most delightful manner. There was an outpouring of melody and most interesting textures in the harmonies. Sung in Spanish, it is a work we would happily listen to even without the visual component. We heard great variety in mood and tempo throughout. The music for the love letter sent by the miller to the princess excelled in sensuality. Much of the other music was propulsive and energetic. Dressed in black and singing the role of Puss was the incomparable mezzo-soprano Ginger Costa-Jackson whose work we have reviewed before. Her expressive voice conveyed all the wily manipulations of Puss although the puppet was doing the cavorting. Ms. Costa-Jackson is a gorgeous woman but unafraid to hide her beauty in the service of a role, as seen in Nixon in China and Fanciulla del West, both at The Metropolitan Opera. Andrea Carroll made a winning princess and used her sensual soprano to good advantage. Her interaction with her father the king (effective baritone Stefanos Koroneos) was quite amusing since the singer's face sat above a tiny body, as did the members of his court--chamberlain, friar and cook. The role of the miller's son was finely sung and acted by baritone Craig Verm. He went from the resentful inheritor of the mangy cat to the son-in-law of the king, all due to the deceitful antics of the cat. Instead of skinning and eating the cat in the first scene, he was persuaded to provide a feathered cap, a cape, a sword and (of course) a pair of boots for the demanding feline. That scene was pure delight. The fiction used to win the princess' hand was that the poor miller's son was a Marquis. The castle for this "Marquis" was taken away from an ogre in an hysterical scene in which Puss tricks the Ogre (sung convincingly by bass Kevin Burdette). We were reminded of the scene in Wagner's Das Rheingold when Wotan and Loge descend to Nebelheim and trick Alberich into giving up the Tarnhelm. 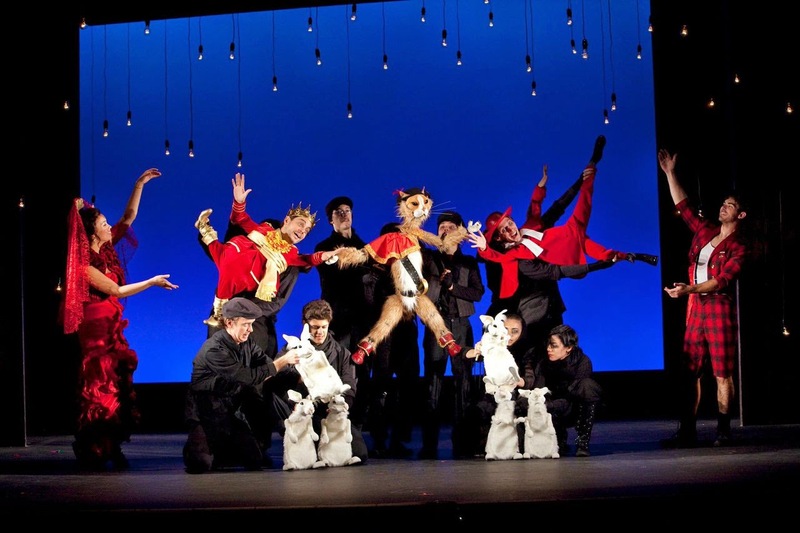 Let us give due credit to the gifted black-clad puppeteers, led by Stefano Brancato; Jonothon Lyons and Aaron Schroeder manipulated Puss; Joseph Gallina, Ben Liebert, Marta Mozelle MacRostie, Jessica Scott and Teddy Yudain did the rest. Not only was there the king's court but a colony of rabbits and the various body parts composing the ogre. Everything was amazing. Regular readers will recall how much we love the Spanish language and how much we love puppetry. This work scored on both accounts. There is no point protesting the brevity of the work; it was completely satisfying. There are several more performances until December 14th and we urge you to go and see how much fun opera can be.